Home / Savings Blog Posts / Holidays / 4th of July Recipes / Loaded Nachos on the Grill Recipe! 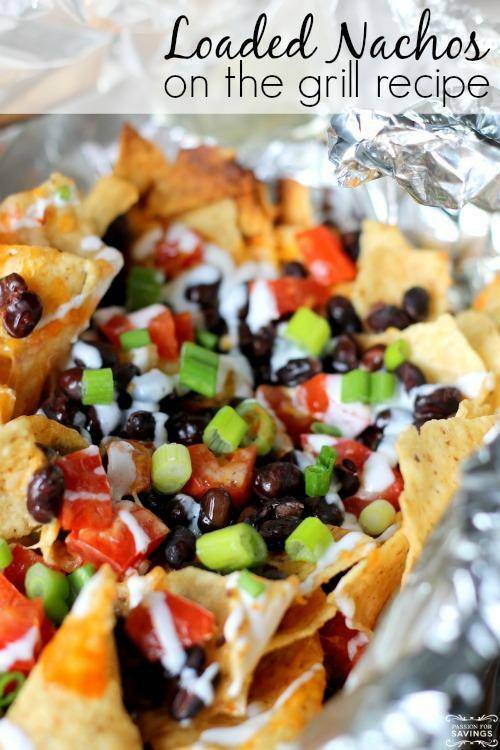 Check out this Loaded Nachos on the Grill Recipe for barbecue season! It’s time to break out the grill and barbecue all Summer long! This Loaded Nachos on the Grill Recipe is a perfect go-to recipe to share with friends or family at a Summer Barbecue! Make these nachos for an easy appetizer recipe or dinner recipe! Plus, this could be a great recipe to take to a friends house if you are celebrating the 4th of July or Memorial Day! Just prepare the grill pack ahead of time and place it on the grill when you arrive! Plus, be sure to check out even more Easy Dinner Recipes and Grill Recipes! Plus, be sure to check out all of the Grills and Grill Accessories at Amazon! Receive Free Shipping with Amazon Prime, or Free Super Saver Shipping on orders of $35 or more! You can also check out this Chicken Fajitas on the Grill Recipe! Mmmm! This is another great Grill Pack Recipe to enjoy all year long! Homemade Strawberry Blueberry Icee Recipe!